Organic baby products don't have to be limited to organic baby care or bathing items, clothing or foods. If you've broadened your horizons and gone organic it's probably a way of life for your family. Once you begin building your baby's nursery theme, why not GO ORGANIC ALL THE WAY! Where organic baby bedding colors were once limited to drab beige tones, this is no longer the case! Many forward thinking moms are requesting only organic baby care products and organic baby gifts at their showers! You know that of all the things we don't want our babies to have it's any kind of allergy! Baby skin is so sensitive that we have to be very careful or a nasty rash can result! Baby skin problems are one thing that organics are very helpful with! What are the components of an organic baby nursery you may ask? You will need to focus on building your nursery with primarily organic items such as organic fabrics, fixtures, furnishings and organic baby bedding sets. Basically the decorating plan should excluce anything containing chemicals not found in nature. Synthetic baby accessories can expose your baby to VOCs (volatile organic chemicals) simply by occupying the same airspace or area where baby will breath. We are only beginning to understand what exposure to these emissions can do over a period of time. Purchasing organic baby bedding and clothing are a great place to begin. Buy only from a company that sells naturally constructed baby furniture and fixtures. Purchase pieces made from start to finish using non-toxic processes. The key here is not so much in the wood itself, but in the glues and paints, varnishes or any finishes that may emit undesirable gases. For instance no organic baby products would ever have a petroleum based finish on the wood. Organic baby crib mattresses will be made from natural fibers such as organic cottons or wools. While woolens don't have an emission problem, baby may still be allergic so use care in exposing baby's sensitive skin to wool in the beginning. When shopping for organic baby products in this area, you may as well outfit the entire layette while at the baby center. You will need to have all the crib linens such as baby blankets, pillows, fitted crib sheets and flat, mattress pads and covers, dust ruffles or crib skirts, and baby comforters made of your chosen organic fabrics even if the item is not in direct contact with your baby. I'm careful when anything is advertised as discount organic baby bedding. Buy your organic baby crib bedding only from manufacturers that you feel you can trust. If you want to sew your own nursery items, you may save money by buying your organic cotton fabric wholesale. Get a pattern or two and start an organic cottage industry in your own sewing room. Air purifiers can reduce difficulties that may arise due to conact with allergens. Dust mites and various tree pollens can cause problems even if they are natural contaminants. Baby will spend most of his or her first year in the nursery with all of your carefully chosen items and other organic stuff, so this is one room in the home where the air should be as clean as you can possibly manage. Check to be sure your paint is not just the best color for a baby boy or girl, but that it has zero or low VOC. Again, we are on a quest for ideal air quality and paint is one of the cheap organic baby products that will help us to move along on that worthwhile journey. 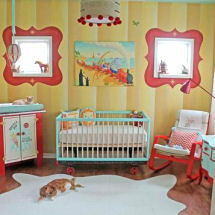 Let's start decorating our organic nursery theme from bottom to top using chemical free flooring choices. Get something that not only is organically manufactured, but that wipes clean to your satisfaction with organic cleaning products. All the rest of your organic baby products will need to be easily cleaned as well. Many experts recommend removing any synthetic carpeting and replacing it with hardwood floors. I personally think a nice washable throw rug makes for a cozier nursery decor. After all, if you can locate an organic cotton nursery rug what's the harm if you launder it properly? You will have to be careful to only buy area rugs colored with natural dyes and no stain protection, however. Return to Unique Baby Gear Ideas, Nursery Themes and Decorating Ideas for more information on how to make baby's nursery more organic, eco-friendly and green.